Keeping your vehicle operating has been our family's goal since 1974. 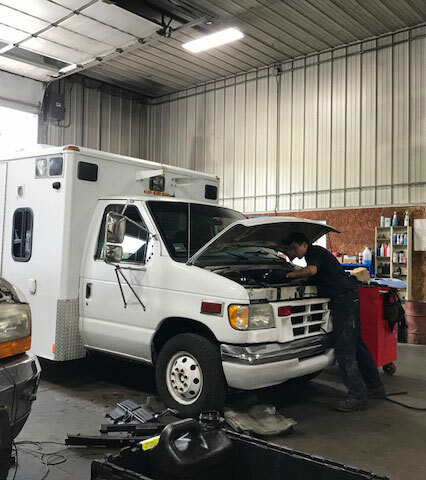 We handle trucks, trailers, on and off road construction equipment, first responder vehicles, and recreational vehicles. We will work on your trucks' engines to keep them running. Transmissions are crucial, and we'll replace or repair them. Losing traction is unsafe, especially if you're running off-road or on the back roads. Let our experts make sure your differential is in good condition. We can install or service your Lubecore automatic greasing system. Keeping your brakes well-maintained is key to staying safe on the road. We can repair or replace damaged suspensions. Call us to restore your damaged or totaled vehicles. We're able to service any brand of vehilce, but we're especially proud to let you know we're a certified Mack Truck parts distributor.